This is one of Wang’s masterpieces, with particularly painstaking detailing and undercutting of the relief design, though the prunus theme is unusual for him. 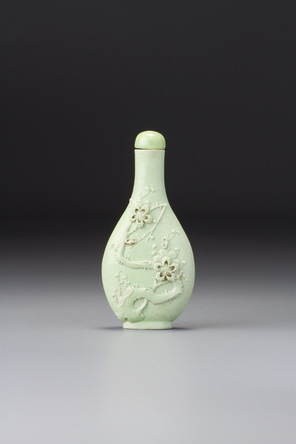 The winter-blossoming prunus was not a common subject for the porcelain carvers of Jingdezhen. This gnarled old tree is splendidly composed and executed, and the two prominent blossoms significant. When a prunus has two unusually large blossoms, it represents marital harmony. Another unusual feature of this particular bottle is the blank reverse. Although Wang’s subjects are customarily focussed on one main side, the design usually extends around the narrow sides to the other main side. 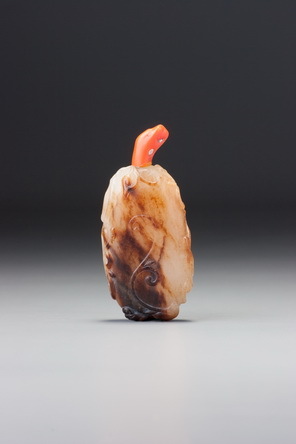 The reverse side accommodates the less important aspects of the design (the dragon’s tail, for instance, in the series of dragon bottles, Sale 1, lot 112, Sale 2, lot 102, and Sale 3, lot 17 ) or, on rare occasions, an inscription (Sale 2, lot 119), but even then the pictorial subject tends to wrap around a little onto the reverse. This is one of his few works with a completely blank back. Perhaps he felt that, having done so well with the front, he need not bother with the back. Or perhaps that decision was encouraged by the shape of the vessel: a radically flat bottle of this sort intrinsically offers itself as a flat canvas for the design, not as a three-dimensional form to be viewed from all sides. The signature here is in one of his two forms of engraved signatures, in seal script; the colour is another of the pastel colours he preferred. The stopper is not the original, although it is an old one of the correct type for these wares. It was not on the bottle when photographed by Moss in the 1960s.